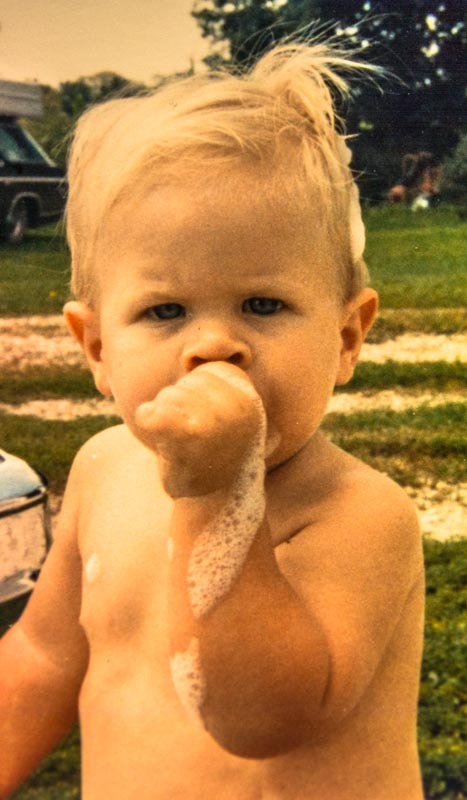 Share the post "Car Wash"
Today, as I was arranging one of my offices, I found an old photo of a client’s child. At that time, I just so happened to have my camera with me, and seeing the expression on his face and what he was doing, I felt compelled to capture it in time. Each time I’ve look at it, it makes me smile. Most people forget that young children are like humans sponges. They appear to be in a constant state of discovery, and their memory grids are working overtime. Over the years in working with couples who have young children, there have been instances when I’ve nearly been stooped with laughter by some of the most delightfully clever remarks and antics. Too many times I’ve found myself being their new best friend. And yes, I have been teary-eyed when at closing I knew I wouldn’t see their smiling faces for likely a very long time. Just recently I was working with a customer who’s daughter is perhaps 10 – 12 months old and continued to follow me with her eyes in a non-stop fashion. Most would consider it annoying; but I didn’t. There was one time when her grandmother was holding her and when I walked up to her shaking my finger and said, “I know you’re reading my mind you clever one.” With that said, she actually started smiling. So cute! Another endearing story is of a young couple of several years ago with three little children. There were two boys and one girl. They all were very well behaved, but the daughter was extremely sensitive about going into strange homes. Over the weeks of showing homes to them, the daughter would absolutely NOT go into a house without me holding her hand all during the showing. It was a bit embarrassing for me because I’m sure her parents must have thought me to have some sort of spell on their daughter. Well, I didn’t. Just remember, children are not toys nor ignorants. They are walking and talking sponges that seem to “know” more than adults at times. Now back to the photo I posted with this article. When I stopped at my client’s home I discovered that the couple was busy washing their car. Little did they know that their little tyke was taking a lunch break, and at that age the thumb was likely the best to be had. Unfortunately he hadn’t yet learned to wash before eating as there were soap suds running down his arm. Everyone needs a break—even working at a car wash.